This exciting project book for children aged 7-14 combines creative play with eco-awareness, while supporting STEAM learning (science, technology, engineering, art, maths). Thirty fun ideas range from building a wind turbine and a go-kart to creating light, growing vegetables, ma... read full description below. This exciting project book for children aged 7-14 combines creative play with eco-awareness, while supporting STEAM learning (science, technology, engineering, art, maths). Thirty fun ideas range from building a wind turbine and a go-kart to creating light, growing vegetables, making green gifts, and more. By cleverly combining creativity with eco-awareness, this timely book encourages children aged 7-14 to put down their mobile devices and get involved. 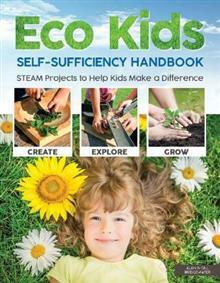 From building a wind turbine and a go-kart to creating light, growing vegetables, and making green gifts, Eco Kids Self Sufficiency Handbook offers a wide range of ways to capture the imagination and make a positive contribution to the world around us. Thirty exciting projects support integrated STEAM learning (science, technology, engineering, art, maths). With easy to follow step-by-step instructions and photographs, no project is too difficult for children to complete with adult supervision. Alan and Gill Bridgewater have gained an international reputation as promoters of the self-sufficient lifestyle. They produce gardening, woodworking, and DIY books on a range of subjects, including furnituremaking, hand tool techniques, stone and brickwork, decks and decking, wood-carving and woodturning. They have written more than 50 highly successful books to date, including The Self-Sufficiency Specialist and The Wildlife Garden Specialist and frequently contribute articles and designs to national magazines.